STUNNING NEW VETERINARY INFORMATION ON KILLING CANCER CELLS! 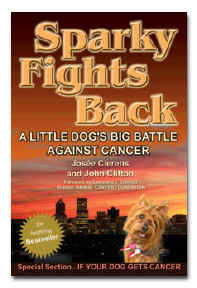 JOHN'S NEW BOOK CONTAINS AN EFFECTIVE REMEDY NOT GENERALLY KNOWN. . . .
Fighting a pet's cancer takes getting the right information. And three other factors. . .
Sparky was diagnosed with non-Hodgkins lymphoma in August of 2000. He was given only a few weeks to live without treatment. Chemotherapy, we were told, could extend his life, perhaps by a year. Our wonderful Sparky was fully one-third of our family. Given these two choices, we naturally chose to treat him. During the course of his treatment we began to explore ways that might extend his life even further. We investigated holistic treatments, diet, anything that might help and not hurt. Sparky lived as his puppy-like, frisky, stubborn, clever, funny and affectionate self for more than eight more years. He finally passed away of general old age conditions in January, 2009, still cancer-free at the age of 14 1/2. Why did Sparky remain in remission all those years? What singles out the fortunate survivors from those not so fortunate? We learned that there are three factors that seem to always be present in successful cases. This web site is for informational purposes only, and the intent is to provide sources of possible veterinary assistance, treatments and other help for owners of animals with cancer in general and lymphoma (lymphosarcoma) in particular. The site does not in any way purport to endorse or make claims for any of the medical personnel, medical facilities, treatments, therapies, medicines, or methods recommended, described or listed herein. Nothing herein should be deemed to be medical or veterinary advice, since no doctors or veterinarians are employed by or connected with this web site. Visitors are directed to consult with licensed veterinarians for all medical advice. Although every effort is made to avoid factual errors, we do not guarantee the accuracy of any of the content of this web site.